“It is a matter of great concern that the federal structure is under increasing strain, merely to suit the whims and fancies of the rulers in Delhi .What we are witnessing today is the systematic disruption of our country’s federal structure both in letter and spirit. “Paradoxically, the rulers in New Delhi have repeatedly flexed their muscles in areas where they should ideally be friendly and cooperative with the states. In order to do so they have not spared any constitutional office. There are many instances of states being targeted through the office of the Governor. Several other bodies are also being misused by the Centre to weaken the states ruled by the opposition in order to score political brownie points. Anguished outpourings of a concerned Indian at the state of present day affairs? 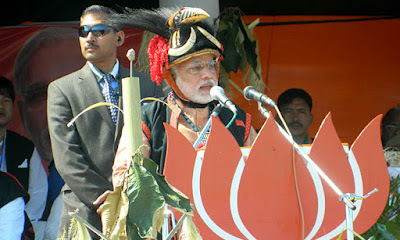 No, excerpts from the blog of Narendra Modi, chief minister of Gujarat on the eve of Republic day, January 25, 2012! The perceivably wronged became the triumphant ruler 18 months ago. What changed thereafter? Nothing, except that perverse politics has gone from bad to worse. The laudable conviction voiced in words has been proved sadistically hollow indeed. The previous government did it so we stand automatically licensed to pay back in kind and then add our own variation of interest to it, remains the norm of the Modi government. Of course, Governors appointed by the previous administration have been pushed or snidely removed to be replaced by worthies of their own liking, in flagrant disregard of judicial pronouncements which state that constitutional appointees could not be so dispensed with before their term. This is being done to destabilize opposition ruled states. The Congress-led government of Nabam Tuki in Arunachal Pradesh went for a toss, destabilized through engineered defections .Now it is the turn of another Congress opposition ruled state. The imposition of President’s rule in Uttarakhand invoking article 356 of the Constitution, just a day before the Harish Rawat government was set to face a trust vote leaves no scope of doubt on the coloured nature of the exercise by the Narendra Modi led Centre. To add insult to injury, the Lok Sabha was prorogued to make sure that the state budget could be passed by executive order to by-pass the numerically stronger opposition in the Rajya Sabha where matters would have stalled. Thus it is that the honourable gentleman who as chief minister of Gujarat took the moral high ground and flailed at the Manmohan Singh led UPA government for practicing coercive federalism today stands guilty of even baser political practices .It is plain subversion of the people’s mandate. How is Modi any better than the previous dispensation? It is now abjectly clear that, having been thwarted in Bihar and Delhi, he has now decided to destabilize opposition-led state governments by the simple ruse of engineering defections and using pliable governors to install their own in power. Manipur and Himachal Pradesh are next on the list. In fact in Manipur, the not so hidden BJP hand is already stoking dissidence against the Okram Ibobi Singh government. In Himachal work on sullying the image of Chief Minister Virbhadra Singh through numerous ‘official’ agencies has long been in the works so as to create grounds for an ’upsurge’ in dissidence and then the topple. Deft hands are at work taking measured paces to sidestep the anti-defection law as well as the landmark 1994 SR Bommai case judgment of the Supreme Court which laid down the law that the majority of any government has to be tested on the floor of the House. In Arunachal a smokescreen was promptly created through a trust motion against the Assembly Speaker. Importantly in both states the rebels lacked the numbers to by-pass the anti-defection law. The Modi government was fast on the uptake imposing President’s rule on the eve of a floor test. Where is the breakdown of Constitutional machinery? Why slyly subvert a popular mandate through the backdoor? Why not elections instead? Because this is possible only after dissolution of the present House .The Upper House has to approve President’s rule. And if you need to avoid that then you need to ‘buy’ enough majority to stitch together an alternative government. This should make Modi’s compulsions clear enough. And then there is union minister Venkaiah Naidu asking the Congress to introspect on why legislators are leaving their party! After describing his boss as God’s gift to India, he should know why. Obviously because of the filthy lucre raining from up there .Even in Bharat mata’s domain there is a price tag to every commodity, politicians included. If cross-voting in the lowly Ahmedabad district panchayat in Gujarat recently, reportedly, carried a price tag of rupees two crores, imagine the transaction – cash or power— involved when the fate of entire state governments hang on breakaway votes. Modi’s doublespeak is now a matter of social media jokes – and there are myriads of examples. But on a serious note this one takes the cake, for in hindsight, it stands out as a reflection of an important political persona who spoke flippantly and now in the hot seat has to eat his words. Quoting Singh’s statement that he would rather go down fighting to push economic reforms, Modi had then said, and I quote, “Dr Manmohan Singh, you do not have the strength in your bones that you can die fighting. You have done it for the foreigners so that they can come here to conquer the trade of India and take away employment”. Just an year after becoming the Prime Minister, on May 12,2015 Modi’s government retained Singh’s decision in its consolidated FDI policy. Would Prime Minister Modi now answer the question he had posed to Singh? Why and for whom? And by the way, the GUJCOC which chief minister Modi had got thrice passed in the Gujarat Assembly was withdrawn from the President by Prime Minister Modi’s government. In politics even pocket books can pose as almanacs!